I have waited so long to get my hands on this novel and finally read it and I am so happy I finally got to. I knew this novel was going to be great and it really was. I loved how snarky Lex is. She was the perfect bad kid. I also loved that even though she was a jerk to everyone that she still really loved her family. She didn't understand why she got so angry and acted out, but it was like a switch and she couldn't control it. She felt guilty, sometimes, after things went bad, but only cause she wanted her family to keep loving her. 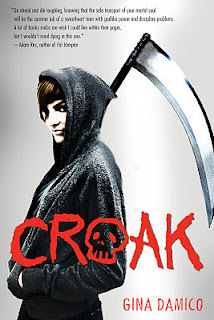 The idea of grim reapers really interests me so I was very giddy to read this novel. It did not disappoint at all. I think Gina did an amazing job with the concept of reaping and explaining how they do their jobs. I think it was very different and unique. Other than the reaping aspects of the novel I really like the friendships that blossomed. I think they were a little fastly formed, but in such a small town you kind of have to stick together. The only problem I had with this novel is that when they are trying to figure out who done it there were some times where if it was me I would have been questioning and piecing somethings together, but they characters didn't until way later on. It kind of bugged me, because it was a little obvious with one of the clues. Other than that little problem I loved Croaked. I think it was an awesome novel and I cannot wait to continue on with the series. The ending was a bit emotional, but thats what I love. I love when you truly connect with characters because of emotion. Very good job Gina! I loved this novel! I love the idea of Grim Reapers and this novel did not disappoint in the reaper area. I think the way that Gina described the reapers jobs was very interesting. I loved Lex's character and was glad to see her character grow through out the novel. I am very glad I got to finally read this novel and I will definitely be continuing on in the series.